Turn Your Raspberry Pi into a Clock #piday #raspberrypi @Raspberry_Pi « Adafruit Industries – Makers, hackers, artists, designers and engineers! 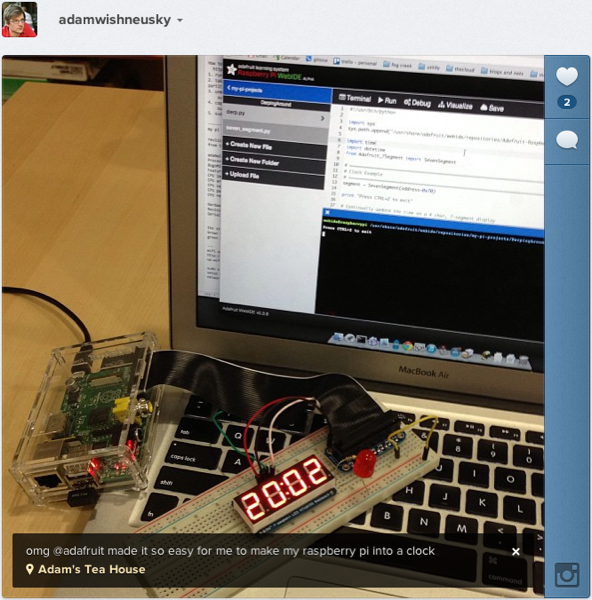 Adam Wishneusky shared his quick Raspberry Pi clock project using a whole bunch of Adafruit gear. Used in this project is the Raspberry Pi Starter Pack, Miniature WiFi Module, 4-Digit 7-Segment Display w/I2C Backpack, and of course the awesome Raspberry Pi WebIDE.